Generous and miserly, cruel and graceful, fascinating nature of this country has always aroused excitement and inspiration. “The most beautiful meeting of land and sea at the time of the birth of our planet” (J. G. Byron) has created many small bays and a large Bay of Kotor, hidden wild beaches and a thirteen kilometers long Velika plaža with healing powers. White and gray waste land of limestone area rises above the coastline. “Sea of rocks” is only one segment of the sumptuous mosaic. In the central region there are the fertile Zetska and Bjelopavlićka plains and a bird paradise - Skadar Lake. Then there is a wreath of mountain ranges over 2,000 meters high. Apart from the peaks, they are adorned by woods, spacious pastures, forty lakes, impetuous and clean rivers, deep and mysterious canyons. The worlds of beauty are under water and underground - in many caves whose exploration has only begun. 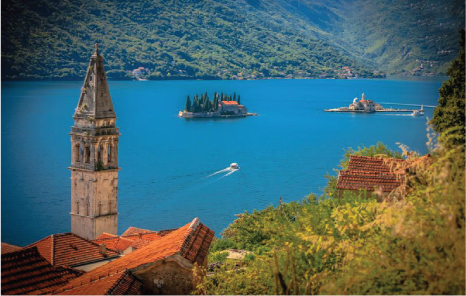 Montenegro has five national parks. Durmitor with the Tara River Canyon is part of the world natural heritage. The Tara River Canyon is on the list of international biosphere reserves, and second deepest in world after Colorado canyon. As a rare wetland habitat Skadar Lake is included on the Ramsar List. However, geographers say that this area in the South of Europe and the Balkans, not large but unique for its diversity, was created in ancient times by the strong forces of nature. Made by forces or not – it turned beautiful and unusual – magnificent.. A state with a long tradition, the meeting point of different cultural and religious influences on the border of Orthodox East and Catholic West, today’s Montenegro is a multi-confessional and multi-ethnic environment functioning in perfect harmony. 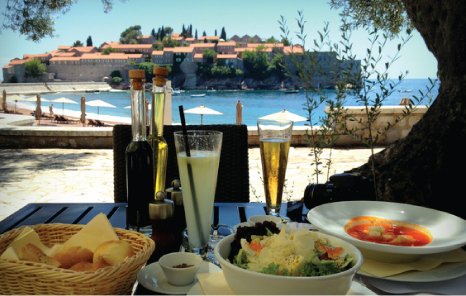 In order to get to the heart of Montenegro you shall try the specialties of the national cuisine. The diversity of Montenegrin nature and the ethnographic diversity have left a trace on Montenegrin cuisine. Whether you are dining at your friend's, in an authentic Montenegrin home, or in some restaurant, you shall be cordially welcomed. Montenegrins are good and generous hosts. When expecting a guest, according to an old time custom, as a sign of hospitality they open wide the door or the gate. They offer to the guest the best food and drink they have in the house, reserve for him the best place at table and do their best to make his stay in their home as comfortable as possible.